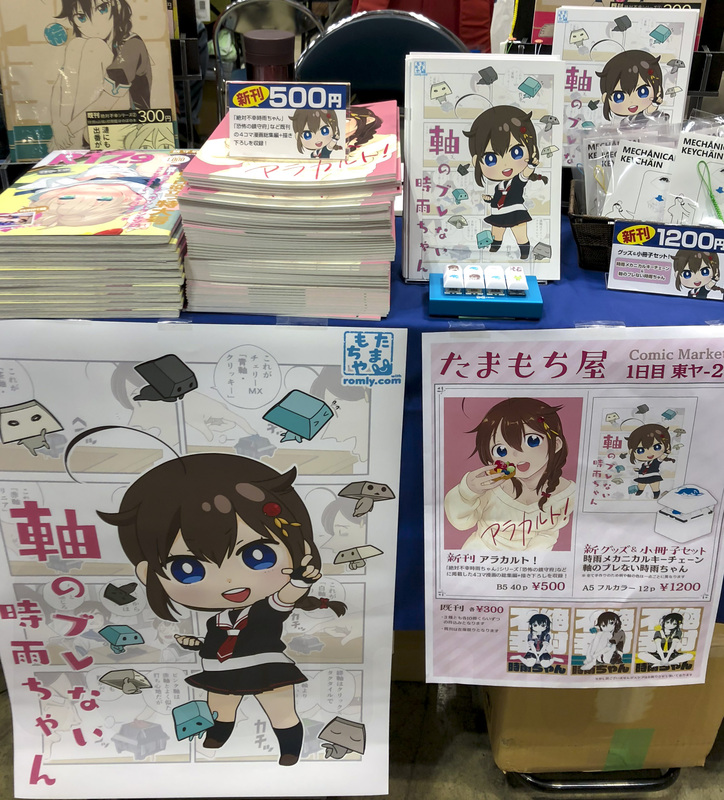 Last year December 29th, the first day of winter Comiket 93 (コミケ), I did sell “Shigure mechanical keychain” and “軸のブレない時雨ちゃんZiku no burenai Shigure-chan” which is super beginners guide to the keyboard. Thanks to everyone, it was sold out. I was very happy. And very sorry, there were people couldn’t get it because it was running out. 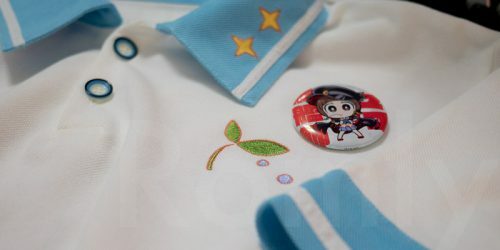 I am trying to make more until the next Kan Colle event “Hourai Gekisen (砲雷撃戦)” takes place on February. The book was about keyboards. Very beginners guide. 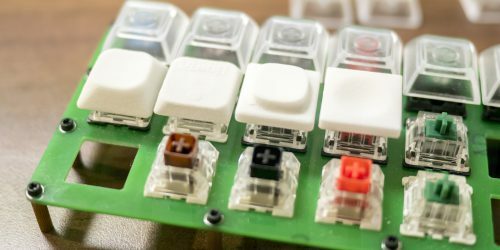 Like “keyboards can be categorized as membrane, mechanical-switch, capacitive.“, “Mechanical switches has very different types“. It was my first time to make dōjinshi, dōjin-goods. At the first, I was going to sell only mechanical keychain which is mechanical-switch keychain with LED. 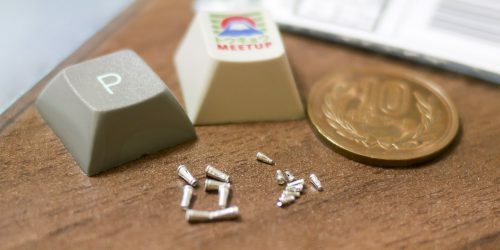 But I thought that it is just a normal keychain to someone who doesn’t know mechanical keyboard. I wanted to know that this is a keyboard button keychain. Also I wished someone who bought it to be interested to keyboards. So I decided to make a small paper about keyboard guide. At that time I was thinking only a A4 size paper or small paper manual like in the capsule toy. It was already fixed that mechanical keychain will be sold at dōjin-circle @tama_mochi_ya. So I asked them to draw a few illustration for the book. As a result, very intriguing Nakayama-Shigre was born. Also Ryotsu-Fubuki is great. * Let me explain, there is a meme “全部同じじゃないですか” (Everything looks the same). It is from #141 KochiKame comic. Ryotsu showed his collections of the Kamen-rider to his colleague. But for colleague, everything looks the same because he was never interested in Kamen-rider. He shouted like “Everything looks the same!?”. Actually the differences are so tiny, only Kamen-rider geek can find the differences. After that it has become a common meme for showing something has very small differences barely noticeable. You can find these in twitter. Also Japanese meme explain is here below. First I had to study about making dōjinshi like “Ondemand”, “Offset”, “Hyo1-Hyo4”. These are terms for making books in Japanese. I think on-demand printing and offset printing are the same in English right? I think Hyo is “cover”. Then I made a actual size book, following the advice. It helps feeling sizes, helps thinking about layouts even it is just a blank. After that I made a draft through imagining reading scene. It has only text, a rough layouts. 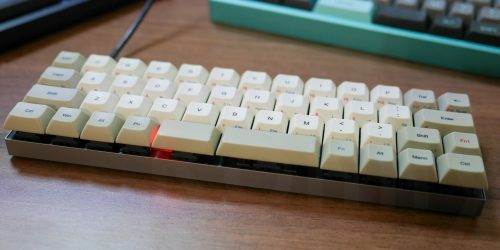 I really like keyboards so I couldn’t stop writing about keyboards. 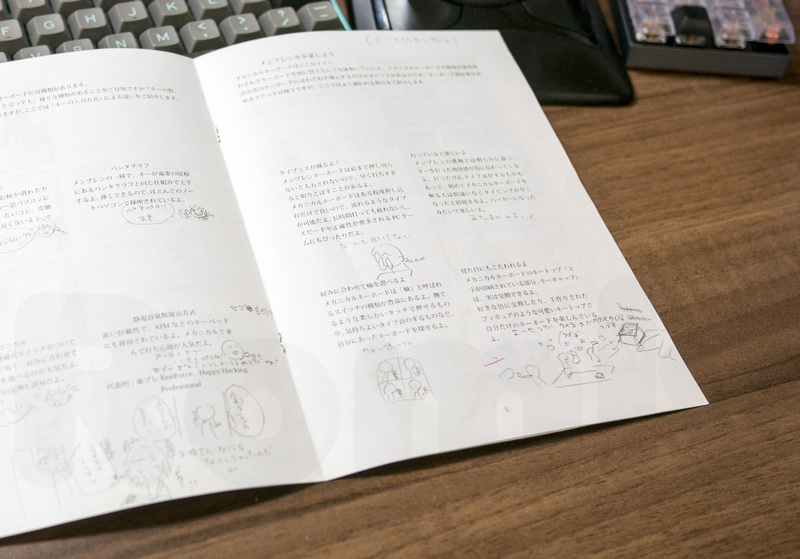 The book becomes 16 pages easily. I wanted someone who doesn’t interested in keyboard to read this book, so I cut all geek talks. 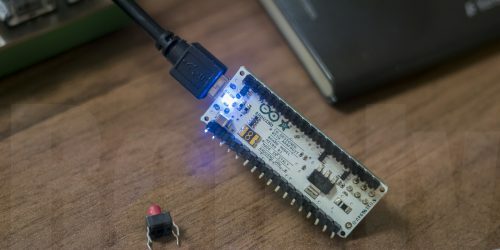 I made it simple, kept paragraphs which beginners can follow. Finally the book has became 12 pages. 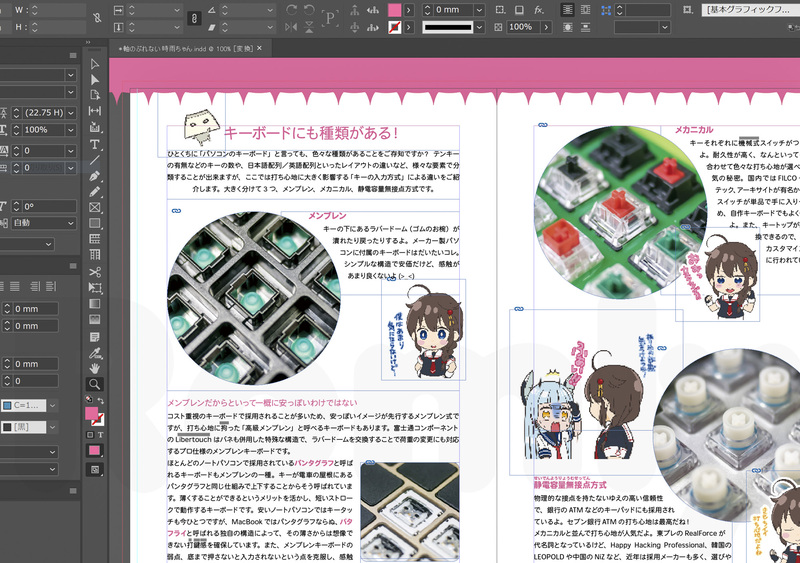 InDesign has function for 面付け (I don’t know how to say 面付け in English, Pagination? Impositioning? ), so I print draft at Seven-Eleven. Number of pages were decided. Layouts were decided. The work only left is giving body and substances. Illustrations were coming while I was having a hard time to make a book. When illustrations inserted, something becomes a true book. I was feeling nervous with a book with only text and photos. But @tama_mochi_ya’s illustrations made a book true something. Especially the cover art. Whatever works for them was fine but honestly, it was totally awesome. I was so fascinated with cute Shigure-chan. 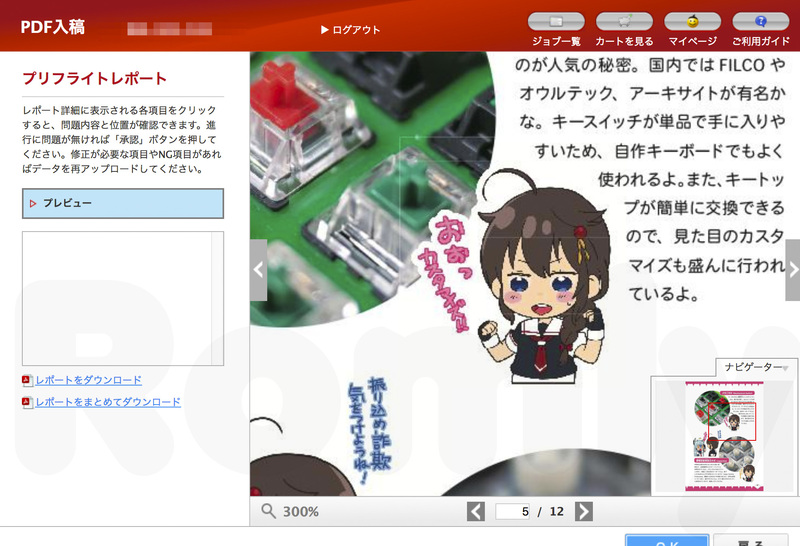 Keycaps around shigure is also cute! Kawaii! After the book data was complete, submitting work is waiting. It is 21st century, I thought RGB data would be printed beautifully but it’s not so easy. “RGB color vivid print” costs money! After all, I decided to re-make data with CMYK. Illustration data has to be CMYK too. @tama_mochi_ya has great experiences with that, they sent CMYK data quickly. But I have to apologize making trouble with them, they were busy too with preparing Comiket. I decided using the company Graphic for printing. They has rumor about good quality of on-demand printing. About paper kind. Coated, Matt-coated, High-quality paper had the same price. It has a lot texts so I decided to go with Matt-coated paper, heaviest one, 135kg because the weight doesn’t related to the price. Submitting process was a bit tricky. I used PDF data for submitting. But there was unknown white lines in images for confirm. Also the images were too much compressed. I was wondering I missed something in PDF export, but turnes out, there was one more confirming process. There was no problem in second confirming. I received printed book around 24th of December. 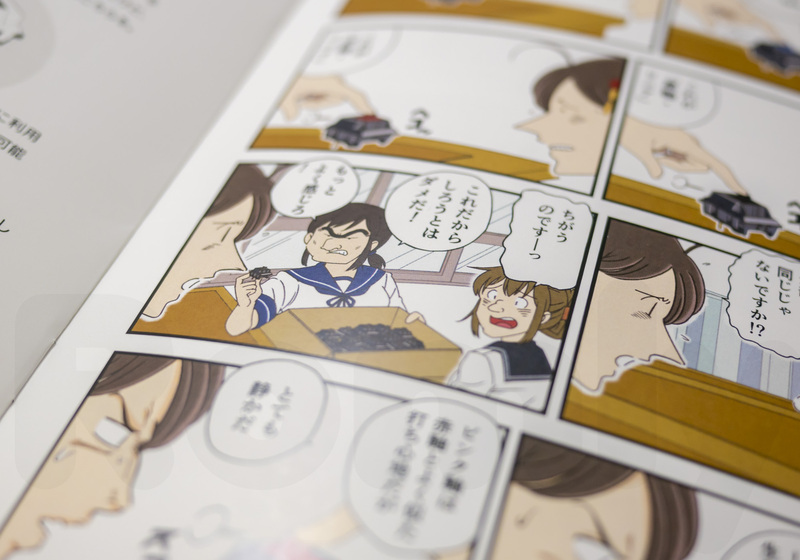 It was my first time to make dōjinshi, so I was not sure how long does it takes. There was only 4 days until Comiket. I was already getting used to reading dōjinshi, but making one is so difficult. Every dōjin-circle makes this twice a year? I can’t believe it. Thanks to dōjin-circles I can read a lot of dōjinshi. It was so hard to make dōjinshi and dōjin-goods at the same time! But the day of Comiket, a lot of people beyond my expectation bought them was so happy! I think @tama_mochi_ya’s illustrations led this book to success because… look at the cover art so appealing, everyone would buy if the book has that cover. They taught me a lot of thing about making dōjinshi based on their experiences. I’d like to take this opportunity to thank them. 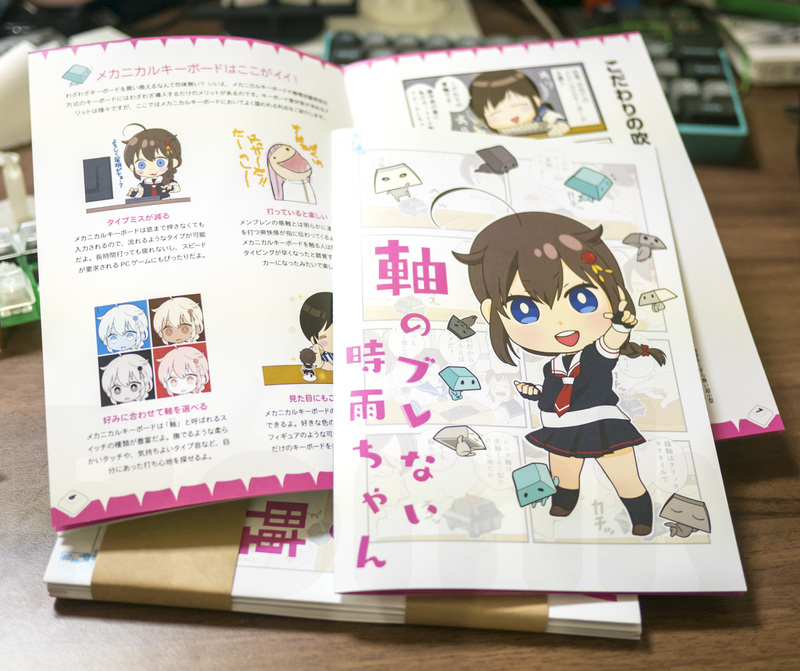 I learned a lot through making dōjinshi! About making books, InDesign, Submitting process… I will not hesitate even if I’m going to make another dōjinshi.